Traditional 1F Felt is suitable for use underneath slates and tiles in cold, ventilated roof construction. Designed to keep windblown water, snow and dust out of your roof space, it also retains heat inside your building reducing energy costs. 1F roofing felts are non-permeable and non-breathable. They are suitable for use in adequately ventilated cold roof spaces. Bitumen based felt with an open hesian weave arer considered by many experts as bat-frindly. They are highly suitable for use in heritage projects. Modern, three layer polypropylene 1F fabrics are slowly replacing traditional bitumen based 1F roofing felt. These modern fabrics have the advantage of being strong, lightweight and clean to use. 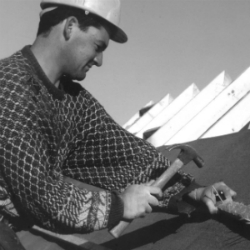 1F Roofing Felt was traditionally known as slaters felt or sarking felt. However modern breathable membranes have also taken on these traditional names, making this a rather confusing area for both professionals and self builders alike. If you need any advice or product support on any roofing materials, please do not hesitate to contact us.